As you pack school lunches, check homework and just get your kids back into the swing of another school year, make sure your children get their teeth checked, too. Although they often go overlooked, teeth in young mouths can get cavities just as easily as adults (sometimes easier). Make sure you visit Oakton Dental Center in Oakton, VA to set your kids up for a cavity-free school year. Kids begin losing baby teeth around the age of 6 or 7, but even before this happens, those baby teeth can still get cavities. When adult teeth come in, you should remind your kids that these teeth need to last the rest of their lives so it’s important to take care of them. Also, oral health is linked to overall health, so a healthy mouth is important to a healthy body. 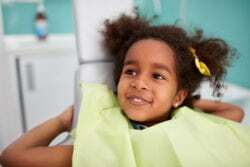 By the time they have finished elementary school, more than half of American children have already had at least one cavity. You can help your child avoid becoming part of this statistic by teaching them the 2 X 2 rule. In brief: brush twice a day for two minutes. Oakton Dental Center also recommends flossing once daily. Parents can assist their kids in following the 2 X 2 rule by making it part of their daily routine. Parents can set a good example by brushing with kids, using a timer, and a fun toothpaste they like. Nowadays, parents have lots of great options for children’s toothpaste available in most stores, and small toothbrush timers are usually stocked nearby. Two minutes can be a long time to keep some kids on task, but the payoff is worth it in the long haul. You may have heard the old saying that an ounce of prevention is worth more than a pound of cure. Keeping their tooth enamel healthy from a young age will help your child avoid cavities and other more complicated dental problems later in life. Speaking of prevention, another tool in the fight against tooth decay is reducing your child’s intake of sugar. While there are many reasons to limit sugar not related to oral health, in this case it’s because bacteria that live in our mouths feed on the sugar we’ve eaten that gets stuck between our teeth. Well-fed bacteria can cause plaque to build up and your child’s tooth enamel to break down, so keeping bacteria at bay before they cause cavities is critical to your child’s oral health. Making brushing and regular dental check-ups are a part of your child’s back to school routine will make sure your child takes a healthy smile back to school this fall. To promote good oral health, make sure you schedule a dental check-up online or call 703.382.6789!